Luca Arbore was one of the important boyards of Stefan cel Mare, being since 1486 the gate keeper of Suceava. He have had defended bravely the Suceava Fortress in 1497 against Polish attacks. He remains in history also by the famous churh from the villages that has his name. 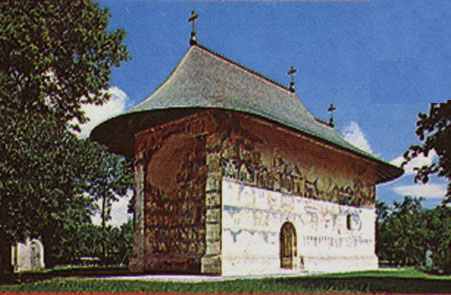 In 1502 was raises one of the important monuments of Moldavia, the Arbore Church. Luca Arbore's daughters comand to the artist "Dragosîn" to paint the exterior walls of the church in order to give more beauty to the foundation of their father. The scences are populated with many character in continous motion. The bright colours are harmoniously combined, giving out warmness. The main colour is green, stealed from the surrounding forests and hills.